I remember my first fandom. I remember being a young girl and seeing advertisements for a new children’s series by a local author. I remember coming out of a book shop with three little hardcover books filled with charming and quirky illustrations and immersing myself for the first time in a world filled with adventure and tragedy. I remember searching the books for hidden codes, filling my commonplace book with facts I read, and eating pasta puttanesca in San Francisco, wondering if I would, by chance, run into the man who inspired me to see so much more in the world than ever before. And most of all, I remember dreaming about the day when all the books that man had written for children my age would one day be put on screen where they could inspire other people as well. That day came on January 13th, 2017. And as this series has been such a defining part of my life for so long, it’s my honor to take you through the Netflix adaptation here on The Fangirl Initiative. I’m sure there are still some of you out there who haven’t seen the show yet and are wondering if it’s something you should try. My answer, of course, in an unequivocal “yes.” But the reasons why you should watch it, and the best way for me to put any doubts you have to rest, depends on how familiar you are with A Series of Unfortunate Events. Have you read the books and are afraid the adaptation isn’t accurate? Were you turned off by the Nickelodeon film that came out back in 2004? Or are you not familiar at all with the series and are unsure of what to expect? Regardless of what category you fall into, we’ve got you covered. 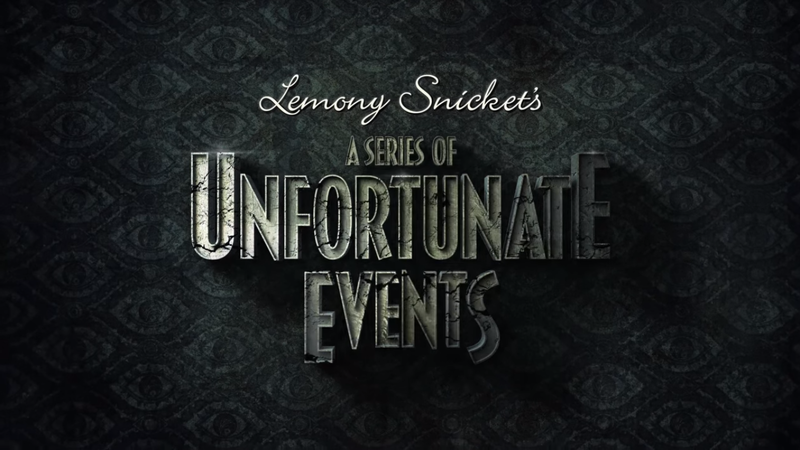 For those completely unfamiliar with A Series of Unfortunate Events, I recommend both the books and the TV show. It doesn’t matter if you read the books first or watch the show first because the show is accurate enough to the books that it’s more or less the same thing. For those interested in diversity, it has strong female characters, POC characters, LGBT characters, and it often explores relevant and controversial topics. The series has a lot to offer from its unique narrative style, great characters, memorable and quirky aesthetic, and unusual sense of humor to its surprising twists and the difficult questions it raises. Although it appears to be a simple children’s series at first, there is a lot more lurking beneath the surface. Hidden codes and clues to a mysterious organization can be discovered by readers and viewers willing to dig deeper. And most of all, the books have a message that is real, tragic, and inspirational – and more relevant than ever before. A lot of people may wonder why someone would write a series so dark. Why have a story that focuses on all the unhappy things that happen to a group of children? Isn’t that just pessimism for pessimism’s sake? But the truth is, the unfortunate events in the series are perhaps the most important aspect of the story. There’s a reason it sets itself apart from other children’s media. In the majority of children’s books and television, the message is clear: you control your own destiny. If you just work hard enough, act moral enough, use your ingenuity and intelligence enough, keep up your health and appearance to be attractive enough, then you can achieve anything. You can do anything you want to do, be anything you want to be. Just try, try, try, and if you fail, it’s only because you didn’t try hard enough. This is where the Baudelaires are different. They are attractive, moral, kind, intelligent, and they never give up and always try to do their best. And yet, their life is a series of unfortunate events. Why? Because the author looked at what we’ve been telling children through the media and saw that we have been lying to them. In a fair world, hard work is all we would need to be happy and successful. But the truth is, life isn’t fair. Sometimes people work hard and never see results. Sometimes people are never given a choice or a chance. Sometimes people are abused. Sometimes people are not in control of their own lives due to age or disability and are forced to rely on people who are unreliable. Sometimes people face prejudice for things they can’t help. The truth is, many things in life require support and teamwork, and no matter how eager or hardworking you are, you won’t get anywhere if those around you choose not to help or refuse to listen to you. Life is complicated, not black and white. Daniel Handler, the author of the series, understands these things all too well. When asked where he drew his inspiration for the series, Handler cited the reliance and helplessness he remembers during childhood, as well as his experiences as a Jewish man whose family was in Germany at the start of WWII. A Series of Unfortunate Events is the story of the abused. It’s about victim blaming. It’s about dishonest media. It’s about the way abuse is perpetuated through good people being unwilling to listen or see outside their immediate perceptions. It’s about how the human race likes to turn a blind eye toward the suffering – to say that those down on their luck deserve their misfortune – because no one wants to believe that bad things can happen to anyone, regardless of who you are or what you do. No one wants to believe it can happen to them, no matter how hard they work or how moral a life they lead. Many people might say that a story on such a dark topic is too depressing to read (and based on his warnings, it seems Lemony Snicket would agree). But I think its message is one of hope. If you’ve ever, like the Baudelaires, experienced a series of events that some would consider unfortunate, you’ll see more in this message than just darkness. For anyone who’s worked hard, done their best, and still gained nothing but pain and abuse, you’ll see a story that tells you this isn’t your fault. And if you’ve ever seen a loved one struggle in vain, wondering why their fight to better their own lives never seems to get them anywhere, you’ll find an explanation for all the pain – and an opportunity to help. 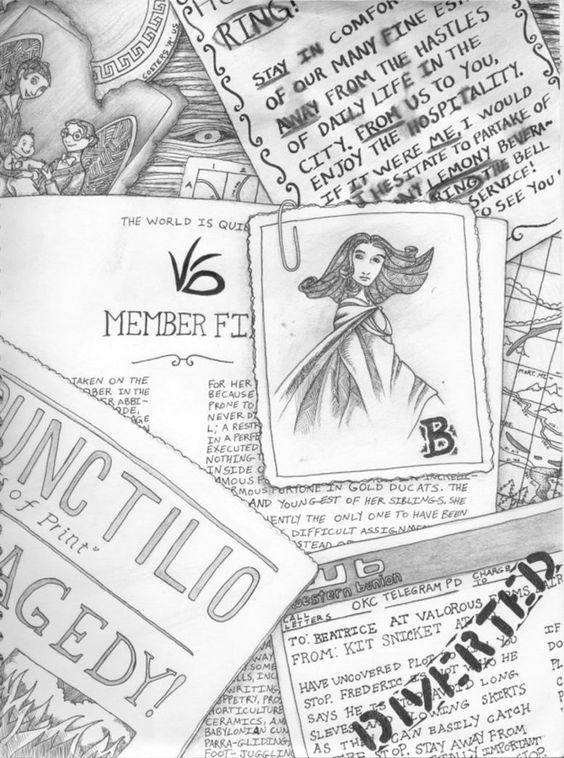 If you're like the Baudelaires, you believe the answer to almost any question can be found in a library. And if the questions you often ask yourself center around the reasons for suffering in the world and what we can do about it, then out of all the books in the library, A Series of Unfortunate Events is a good place to start. If you believe that hard work and talent inevitably leads to happiness and success – that those down on their luck simply did not try hard enough – “If you prefer to view the world in black and white,” as Lemony Snicket says, “avert your eyes or pick up a newspaper instead.” However, if you believe there’s more to life than that – that there are victims deserving help, villains deserving defeat, safe havens to create, and hearts that need opening – the ASOUE fandom welcomes you home. We live in a world filled with misfortune and fire. And the only way justice will prevail – the only way the world can become a quiet place once more – is if we put away our prejudices and preconceived notions, and open our ears and hearts to those who have fallen through the cracks. Let’s volunteer to make it so. As you may know, the Netflix adaptation is not the first time A Series of Unfortunate Events has been put on screen. In 2004, a film adaptation hit theaters and… was not exactly successful. Since many were turned off by the film, I have seen some people reluctant to try the Netflix show as they are afraid it will be more of the same thing. If you are one of these people, let me tell you that you can put these fears to rest. The Netflix adaptation is nothing like Nickelodeon’s. For one thing, Nickelodeon, being a very large mainstream studio, approached the film from the angle that most big studios do: changing the story to try to fit a marketable formula. And because the appeal of the books is the ways in which they break the formula, this plan backfired. Another factor was the fact that the film starred Jim Carrey – an actor famous for his own style and improvisation. This meant that, in order to take advantage of the actor’s talent, the story had to be further tweaked for his improvisational lines to be incorporated into the movie. What’s more, while the original author of the books, Daniel Handler, was willing and eager to add his input into the making of the film, he was outright ignored and even mistreated by the studio. This resulted in a film far from the original vision of the author. And because they were also cramming three books’ worth of story into one film, the story was rushed. Overall, Nickelodeon did everything wrong when it came to adapting this story to screen. The fault of the movie’s failure lies with the studio, not the story itself. Therefore, there’s no reason to believe an adaptation of the books made by an entirely different studio would be destined for failure. And looking at the finished product, it appears Netflix did everything right. Their focus was on storytelling rather than money and marketability. They made accuracy to the books their focus. They listened to input from the author and even had him write the script. They hired actors who excel at unleashing their creativity within the parameters of an already-established story. They took their time in telling the story, allowing two 40-50 minute episodes per book. And since there are no ads on Netflix, the story could be told however they wanted, rather than based around when they need to break to a commercial. What resulted was a faithful adaptation and a unique story that focuses on the characters and the heart of the books. Therefore, regardless of how you feel about the Nickelodeon film, I wholeheartedly recommend Netflix’s A Series of Unfortunate Events. If you've read the books, you’re probably a bit wary of watching the Netflix adaptation, afraid it’ll take the story you love and turn it into something… well… embarrassing. Especially after the trailers showed a very childish, lighthearted tone and cheesy humor. As you can probably tell, I was not a fan of the trailers. And if you’re like me, I want to ensure you that you have nothing to worry about. I’ve seen every episode of season one, and the trailers were not accurate to the final tone of the series. The show is something that adults will very much enjoy. And while the humor can be cheesy at times, it can also be quite clever – like the humor in the books, in other words. You’ll be happy to hear the show honors its source material to the fullest extent. The adaptation is so accurate, you can read along as you watch, for the most part. The only serious deviation is that the mystery concerning the secret organization is introduced earlier – which I consider a plus, since the author wanted to do that anyway in the books but couldn’t because the publishers wanted to give the series a “test run” with four stand-alone books first. What’s more, the adaptation is not only accurate to the events of the books, but the spirit as well. While watching, I got the impression that everyone involved in production was having a lot of fun. Every part of the story feels like it belongs, unlike a lot of other “accurate” adaptations where some things feel shoehorned in just for the sake of accuracy. Everything feels very natural. It felt like the cast and crew were quite proud of the original source material, unlike a lot of film directors who try to “improve” on the original by making it more “marketable.” Daniel Handler, the author of the original books, even writes the script, so you know that can’t go wrong. I’ve seen a lot of book-to-screen adaptations, and Netflix’s A Series of Unfortunate Events is the first and only time I’ve been able to say that it doesn’t matter what you do first – read the books or watch the show – because they are both just as good. Starting March 10, we’ll be taking an in-depth look at each chapter of Netflix’s A Series of Unfortunate Events. We hope you’ll join us!